When trying to get a flawless finish with your makeup look, an airbrush foundation kit can really make all the difference. In this article, we’ll tell you what to look for in your airbrush makeup, and review the best airbrush makeup on the market. This airbrush makeup set comes in a variety of different colors and finishes, which helps you find the shade that is perfect for your needs. The kit comes in light, medium, or tan color ranges, and matte or luminous finish. Each kit comes with three different shades so you can mix and match for a custom color. The kit also comes with an airbrush blush and loose finishing powder. The makeup is silica/mineral based. This system provides great bang for your buck - it is very affordable and the foundation lasts an incredibly long time because it is so high coverage. Because it does have such a high coverage, it is important to apply sparingly because it can look cakey if you use too much. The machine is very easy to use as well, it is very simple to adjust the flow of air coming out. Very affordable, especially considering the amount of makeup that you get. This set is a more expanded version of the previously reviewed product. It contains the same system, which is very easy to use and gives amazing coverage and finish. The airbrush system is very easy to adjust as you are using it for both detailed work and covering larger areas. The biggest difference between the two kits is that this one comes with a bigger range of makeup and tools. This kit comes with five foundation colors, a primer, blush, concealer, highlighter, and finishing powder. It comes in the same matte and luminous finishes. It also comes with a makeup bag to hold all of your products, which is a huge benefit for professional makeup artists. 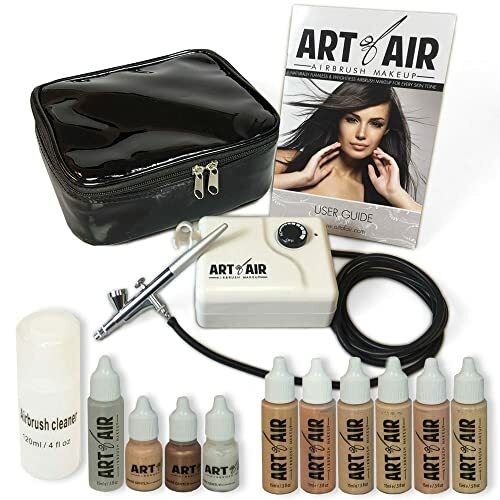 This airbrush system comes with six foundation colors, blush, bronzer, shimmer, and primer, as well as the airbrush system itself, which is very compact and comes with a carrying case for easy travel. It also comes with an airbrush cleaner, which is very handy for making sure you get the system cleaned between every use. This system uses water-based makeup, which results in a very even matte finish. This kit provides amazing quality - the makeup lasts an incredibly long time. Although the system can take some time to get used to and to learn how to use, it is worth it once you get an amazing makeup look. The color range in this system is particularly good, as the colors can be combined to get a good match, and you also have bronzer, blush, and highlighter to work with to get your desired look. The system is very easy to adjust as you use it - instead of having a few settings to choose from, you can twist a knob to get the perfect amount of product as you are putting on your makeup. This system comes with five foundation shades in the range that you choose, as well as two blush shades, a highlighter, and a bronzer. This makeup is great for those who have sensitive skin, because it is water based and contains botanical ingredients that are very soothing on the skin. It doesn’t have any fragrances or parabens that could cause skin irritation. This kit is compactly designed so you can easily travel with it, and it comes with a simple AV plug for power. The compressor is very quiet, so you can use it without bothering your family or friends that are around. The company also stands out because they have incredible customer service - they have a full year warranty on the kit and are happy to answer any questions or concerns you may have. This is an expansion pack for the system reviewed above. It contains the same great system, and the makeup uses the same formula. The difference is that the makeup comes in a huge range of colors. It comes with 16 foundations, six blushes, a bronzer, and a highlighter. This is a great option for anyone who works as a makeup artist and needs a variety of different colors to suit their clients. Many people wonder: why should I use airbrush makeup instead of traditional foundation? Doesn’t it do the same thing? 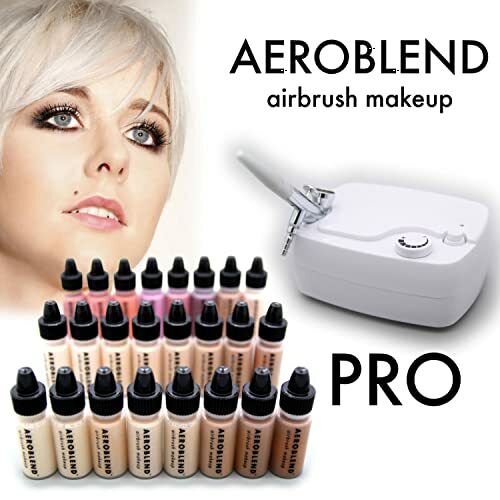 Airbrush makeup is extremely high quality, so it has many benefits over traditional foundation. Airbrush foundation is waterproof. This means that it will stay on much longer throughout the day, and is perfect to wear during long events. Even if you sweat, cry, or stand in the rain, airbrush makeup will not come off. Airbrush makeup is very lightweight, unlike traditional foundation. Normal foundation can have a "cakey" look as it sets throughout the day, whereas airbrush makeup looks very natural and feels light and comfortable on the skin. Airbrush makeup is very sanitary to apply because your skin doesn't need to come in contact with a brush or skin that could contain germs. This makes it a good choice for people who have sensitive skin. Airbrush makeup has a very even coverage that hides scars, acne, dark circles, and other skin imperfections. While traditional foundation also covers up these things, it is much more difficult to work with, and you often need to cake on several layers to get the same level of coverage that you would with a traditional foundation. Not all airbrush makeup is created equal. You want to ensure when you are buying the makeup that you are getting something that the best quality. If you haven't worked with airbrush makeup in the past, it can be difficult to determine if what you are buying is worth the investment. Here's what you should look for when purchasing airbrush makeup. Airbrush makeup traditionally comes in three different types of formulas: water, alcohol, and silicone. Each has a slightly different finish. How Easy is The Makeup to Apply? Even if you use makeup on a regular basis, it can still take a little while to get the hang of applying airbrush makeup. When purchasing an airbrush makeup system, see if you can test it out in store, or watch demo videos online of the system being used. This will give you an idea of what the application process will be like. Make sure that the kit comes with the shade of foundation that you will need. Most airbrush makeup kits are designed for professional makeup artists, which means that they will include multiple shades of foundation. Some include blush or highlighter as well. It is very important to make sure the kit comes with the right shades for you. You may even be able to mix the shades to come up with your own custom color that really suits you. 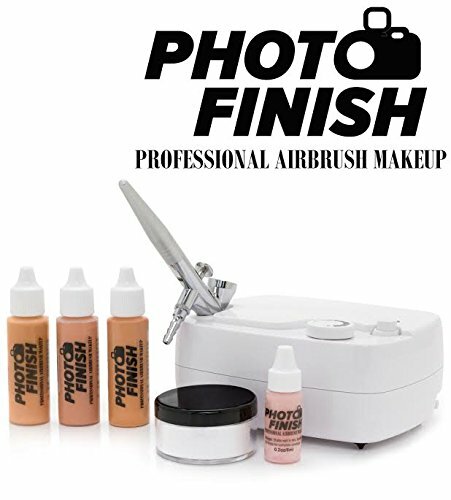 A good airbrush makeup set should work well for both detailed work and covering large areas. Ideally, the airbrush gun should have multiple settings so you can easily switch back and forth depending on what you are doing. You may need to switch in and out of different sizes to cover acne or other imperfections. It is also very important that the airbrush makeup set is easy to clean. For sanitary purposes, you should easily be able to clean all the makeup out of the set after each use so that you don't have any gross, expired makeup built up in there. Many airbrush makeup sets come with a convenient cleaning kit to make this easier. 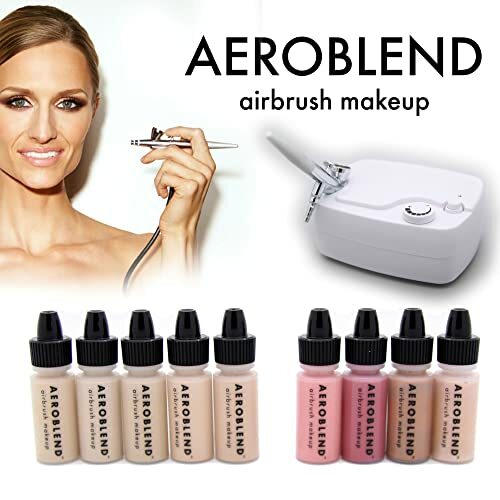 While we love all of the airbrush makeup that we reviewed, the best airbrush makeup system in our opinion is the Aeroblend Airbrush Makeup. We love this system because the makeup is of amazing quality, comes in a great shade range, and does not irritate the skin. 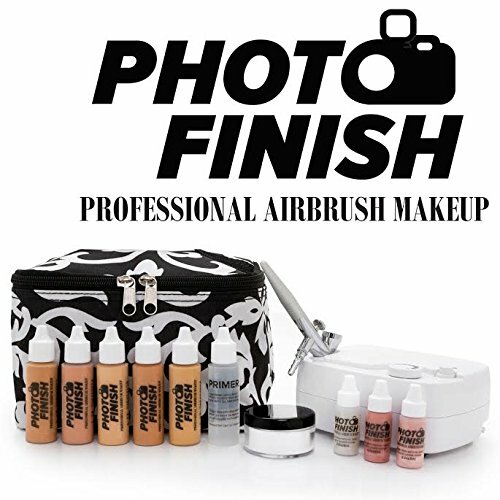 Thanks for stopping by our Airbrush Makeup Kit System article! I hope choosing airbrush makeup is now easier after you read this article, which one is the best for you? Share with us by comment bellow.